Boils and carbuncles are red, painful lumps on the skin that are usually caused by a bacterial infection. Boils can develop anywhere on your skin, but you're most likely to get one in an area where there's a combination of hair, sweat and friction, such as the neck, face or thighs. Over time, pus forms inside the boil, making it bigger and more painful. Most boils eventually burst and the pus drains away without leaving a scar. This can take from two days to three weeks to happen. 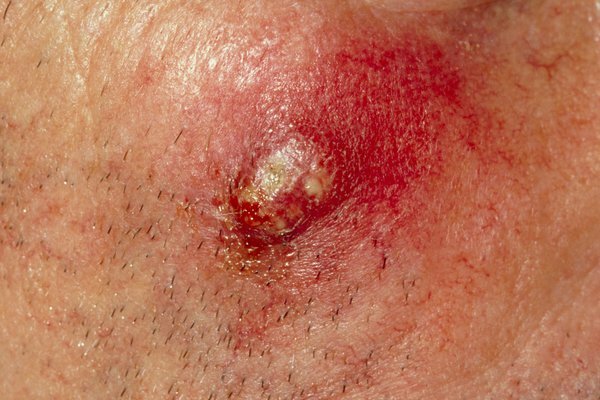 It can sometimes be difficult to tell the difference between a boil and a spot, but boils tend to grow bigger and become more painful. Your GP should be able to diagnose a boil from its appearance. A carbuncle is a dome-shaped cluster of boils that usually develops over a few days. The areas most commonly affected are the back, thighs, or back of the neck. A carbuncle can grow to a size of 3-10cm and will leak pus from a number of points. Carbuncles are less common than boils and tend to mostly affect middle-aged or older men in poor health or with a weakened immune system. See your GP if you think you have a carbuncle. Your GP should be able to identify a boil or carbuncle by looking at it. Most boils get better without the need for medical treatment. One of the best ways to speed up healing is to apply a warm, moist face cloth to the boil for 10-20 minutes, three or four times a day. The heat increases the amount of blood circulating around the boil, which sends more infection-fighting white blood cells to the area. When the boil bursts, cover it with sterile gauze or a dressing to prevent the spread of infection. Afterwards, wash your hands thoroughly using hot water and soap. Never squeeze or pierce a boil because it could spread the infection. You can use over-the-counter painkillers, such as paracetamol or ibuprofen, to help relieve any pain caused by the boil. If your boil doesn't heal, your GP may decide to drain it, or refer you to hospital to have this done. They'll usually numb the area first and then use a sterile needle or scalpel to pierce the boil. It's very important to finish the course of antibiotics even if the boil goes away, otherwise the infection could return. You're likely to need further treatment if you keep getting boils or carbuncles. Most people who keep getting boils are carriers of Staphylococcus aureus (staph bacteria). This means they have staph bacteria living on their skin or inside their nose. Treatment will depend on where the bacteria are found on your body. An antiseptic soap can be used to kill the bacteria on the skin. Bacteria in the nose will need to be treated with a prescribed antiseptic cream for up to 10 days. Boils and carbuncles are often caused by a type of bacteria called Staphylococcus aureus (staph bacteria) that infects one or more hair follicles. Staph bacteria usually live harmlessly on the surface of the skin or in the lining of the nose. You can get a boil when bacteria enter the skin through cuts and grazes. Your immune system responds by sending infection-fighting white blood cells to kill the bacteria. Over time, a mixture of dead bacteria, dead white blood cells and dead skin cells builds up inside the boil to form pus. A carbuncle develops when the infection spreads further beneath the skin to create a cluster of boils. Although most boils and carbuncles don't cause further problems, some people develop a secondary infection. This can range from a relatively minor (though often very painful) infection of the deeper layer of the skin, such as cellulitis, to rarer and more serious complications, such as sepsis. Larger boils and carbuncles can also lead to scarring. Can I catch a boil or carbuncle? Yes, you can. Unlike acne, boils and carbuncles can spread to another part of the body or to another person.